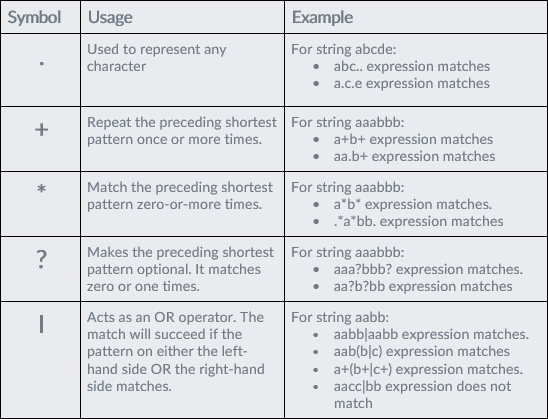 Regular expression allows you to use a sequence of symbols and characters to perform a string or pattern match. VWO provides limited support for using regular expressions for defining visitor segments during reports segmentation. All regular expressions are case insensitive. VWO does not perform case-match for any string. Most regular expression implementations match part of text. To enter a regular expression matching the end and start of a string, use ^ and $ in the expression respectively. VWO regular expression support for requires all patterns to be completely anchored. There are certain characters that form a part of the regular expression language. To match these characters, these characters must be escaped. For example, the ? character is a reserved character in regular expression. To match this character in the string, it needs to be escaped like abc\?